On November 20th, 2012, Met. 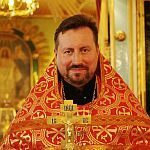 Hilarion (Alfeyev), head of the MP Department of External Church Relations (DECR), flew to France in order to prepare a coordinating session with Phanar hierarch concerning continued ecumenical events with the Vatican. This coordinating committee demonstrates the firm commitment of the MP to continued ecumenical relations with Vatican bishops. Met. Emmanuel, the chief Phanar representative was present as well. This recent round in MP and Vatican ecumenical relations was preceded by Pat. Kirill’s signing of an ecumenical concordat with Polish RC bishops, and Met. Hilarion (Alfeyev) visiting Rome with Pat. Kirill’s blessing to meet Pope Benedict.